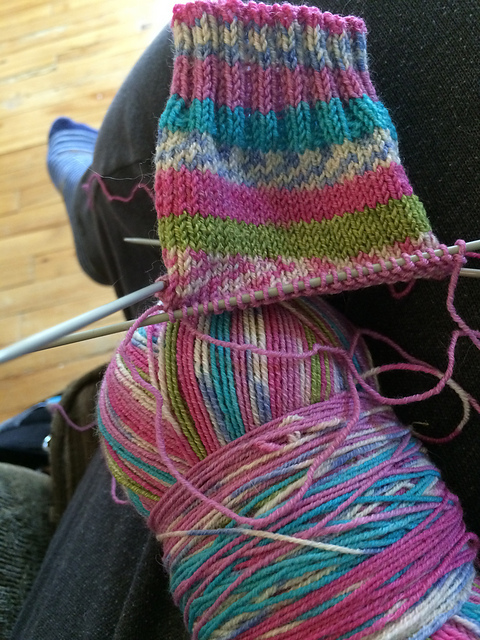 Last week was really hot and humid so all I really wanted to knit was quick small projects like toys… and socks. And that’s great, because earlier this spring I received a couple skeins of Artfil Coktail self-striping sock yarn in color strawberry-almond from the lovely Yana. 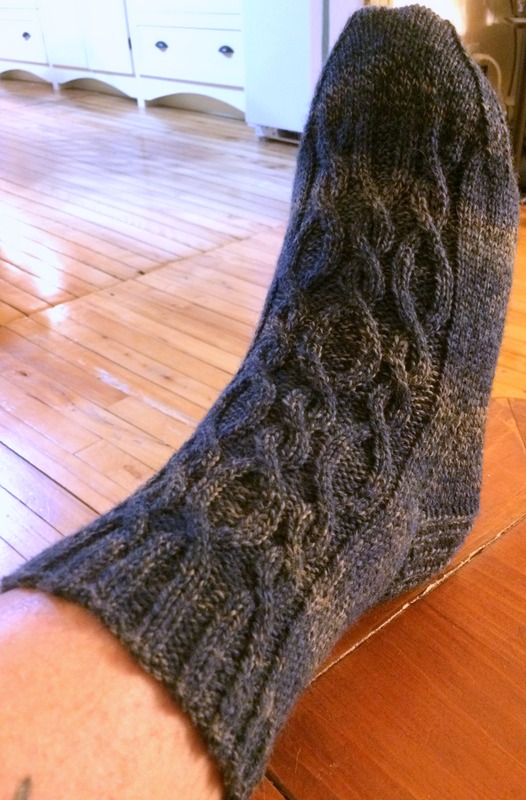 I thought the yarn was so deliciously scrumptious that it deserved to become something a little special to me – so I used it to make my first (ever) toe-up 2-at-a-time sock design. 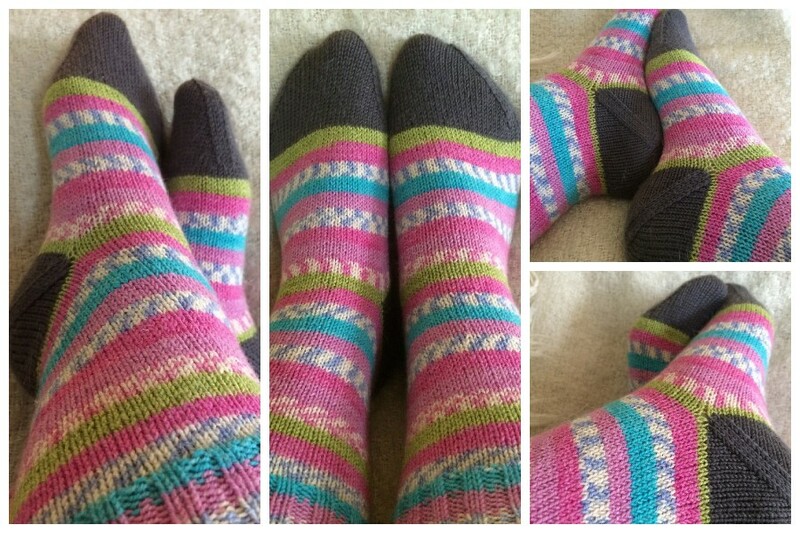 I had a lot of fun making these socks, they are relatively basic and feature Judy’s magic cast-on for the toes, a moss stitch instep&leg and a slipped stitch German short-row heel. The texture and construction is perfect for self-striping, speckled or variegated yarns, and they can be made as long (or as short!) 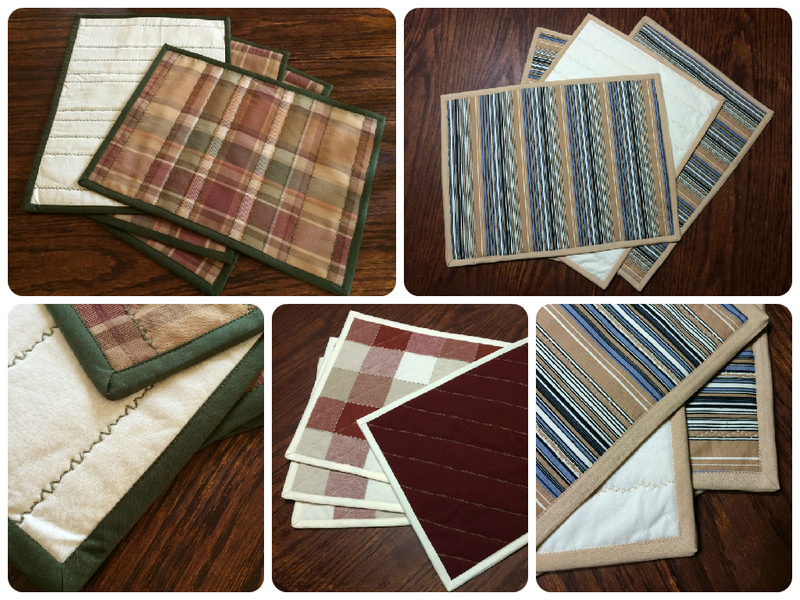 as you want them to be to fit any yardage you have on hand. If you’re interested in the yarn, you can visit Artfil’s website to find a retailer near you or subscribe to their sock yarn club, it’s available in 3, 6 or 12 months subscriptions. This entry was posted in Knitting and tagged 2-at-a-time, adventure, art, color, craft, fiber, knit, knitting, merino, needle art, needle craft, passion, sock, socks, stripe, stripes, texture, toe-up, yarn. Hey guys! As you may (or may not!) remember, earlier this summer I won this amazing gift basket from the girls at Pompon Laine Café for being one of the first clients to get the membership card for the store (very sweet, isn’t?). Well, among all that fiber-y goodness, there was a pinkish ball of stretchy self striping yarn from Lana Grossa called Meilenweit 100 Cotton Fantasy Stretch that I had never used before, so I was a little intrigued. Looking at the yarn, I really couldn’t picture what it would look like all knit up so I decided to try it and find out. 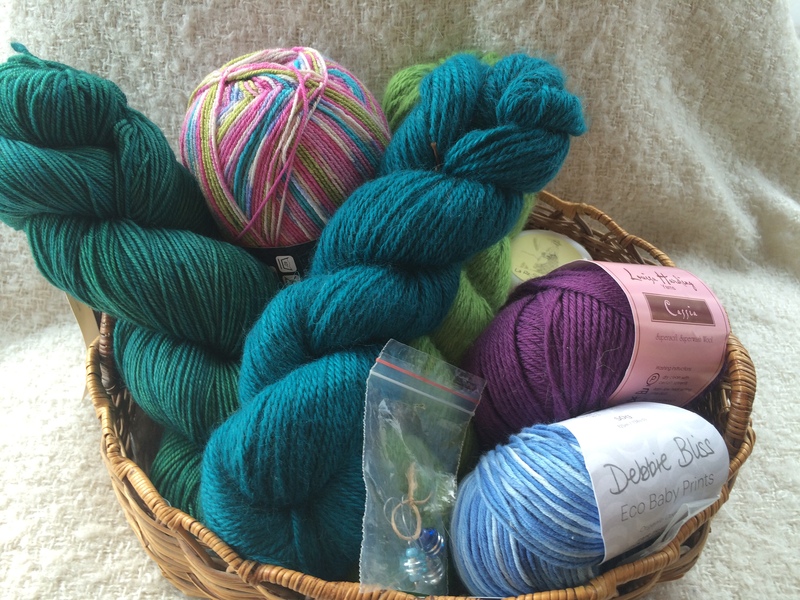 First rule in knitting: when you don’t know what to expect out of a yarn, stick to basics. Following this simple rule, I decided to cast on a basic cuff-down sock, 72 sts on 2.25mm needles and started knitting away, using a 2×2 rib for the cuff. A little ways in, I was able to see the yarn was indeed self striping and was able to assess the width of the stripes and the length of the color sequence. Pretty cute, isn’t? Looking at all these cute stripes go, I thought to myself it would be a pity to break it up working a heel flap, so I decided to try a new (to me!) sock technique to preserve the perfect stripe sequence: the afterthought heel. Now, I when I say it’s a new technique, it doesn’t mean that I learned about it recently – I have known the technique for quite a while, I have just never used it before. Part of the reason is because I’ve never had the chance to work with a self striping yarn before so I never really saw a need for it and the other part of the reason is that I’ve heard mixed reviews about this technique, saying it always pulls and creates holes on the sides. Well, after trying it for myself, let just say this : yes, it does create small holes on the sides, but it’s really not that bad if you pick up a couple stitches on each side to bridge the gap, and I also knit them through the back loop on the first row after pick up to get a fuller look by twisting the stitches. And it works. So if you’ve been worried about that, there’s really no need to fret – I guarantee it. All in all, I would definitely use the afterthought heel again for any self striping yarn, but I’m not so sure about the yarn. First thing first, I must say that I definitely would not have chosen this colorway for myself – but as they say beggars can’t be choosers, so I really can’t complain when I got the yarn for free. But what turned me off the most about this yarn is actually not the color, but the texture. Don’t get me wrong, I love the finished socks, they’re nice and cozy and the stretch in there really makes them comfortable, but somehow the yarn is a little rough to the touch so it wasn’t super fun to knit. It’s a great sock yarn, but I guess for me enjoying the final product is not enough, I have to fully enjoy the process too – which is why I might not buy this yarn again. This entry was posted in Knitting and tagged adventure, art, craft, fiber, knit, knitting, passion, sock, socks, stripes, wool. In the last couple weeks, I got to finish two projects that have been on the needles for a while. The first one is the manly socks I made for my Honeybee, and the second one is the Seesaw Tee I test knitted for Nell Knits. The socks were made without a pattern using some Patons Kroy Socks FX yarn my Honeybee picked out earlier this winter. I quite like the result, although I realized afterwards the two skein were not exactly the same color. Oopsy! 2) it tends to shed, and I experienced a little bleeding on the first wash – nothing major though! This entry was posted in Knitting and tagged alpaca, art, cable, craft, fiber, knit, knitting, lace, passion, silk, socks, sweater, wool. WIP tour 2015 departing, all aboard! I have been pretty busy craft-wise in the last few weeks going from knitting and crocheting to sewing and weaving, and that translates as quite a few WIPs in the works right now. Since I haven’t blogged about any of my current projects so far, I thought it would be interesting to share with you what I’ve been up to lately. The first WIP I want to share with you is a cute pair of lace socks I’m making using some Cascade Heritage yarn I had on hand. I improvised this design using a basic feather and fan pattern for the cuff and a simple eyelet pattern for the foot. It’s a very simple and fun pattern to knit, so when I’m done with the second sock I think I’ll publish the pattern on Ravelry for others to enjoy too 🙂 Let’s share the love! 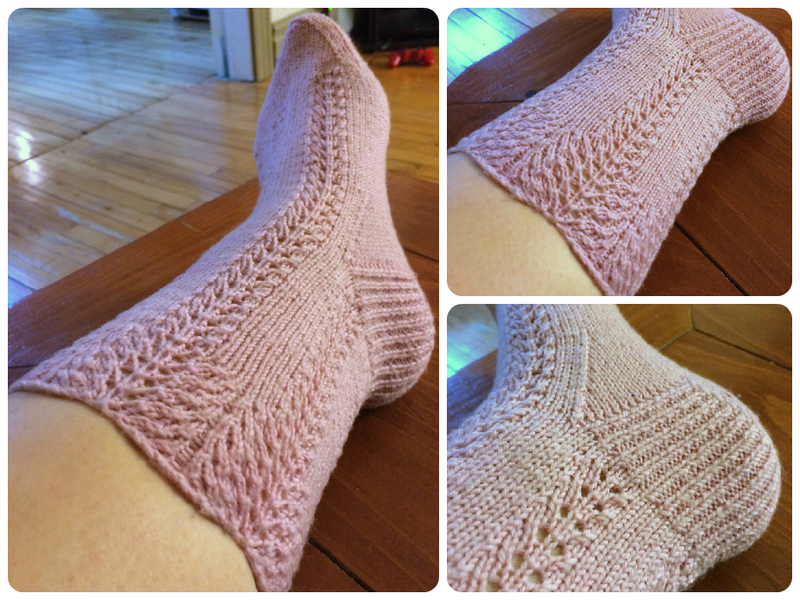 Since I made the lace socks for myself, I also had to make some socks for me Honeybee – you know how it goes! And since he’s a little picky about colors, I didn’t have anything in stash that suit his taste so we went yarn shopping last weekend in Burlington. He set his heart on a yarn I had never worked with before, Kroy FX sock yarn in Cadet Colors. Although I do find the yarn a little thick for a sock yarn, I must say I do like the color variations a lot. And somehow, it seems to fit the cable pattern I came up with pretty well. Another possible free sock pattern? Maybe. 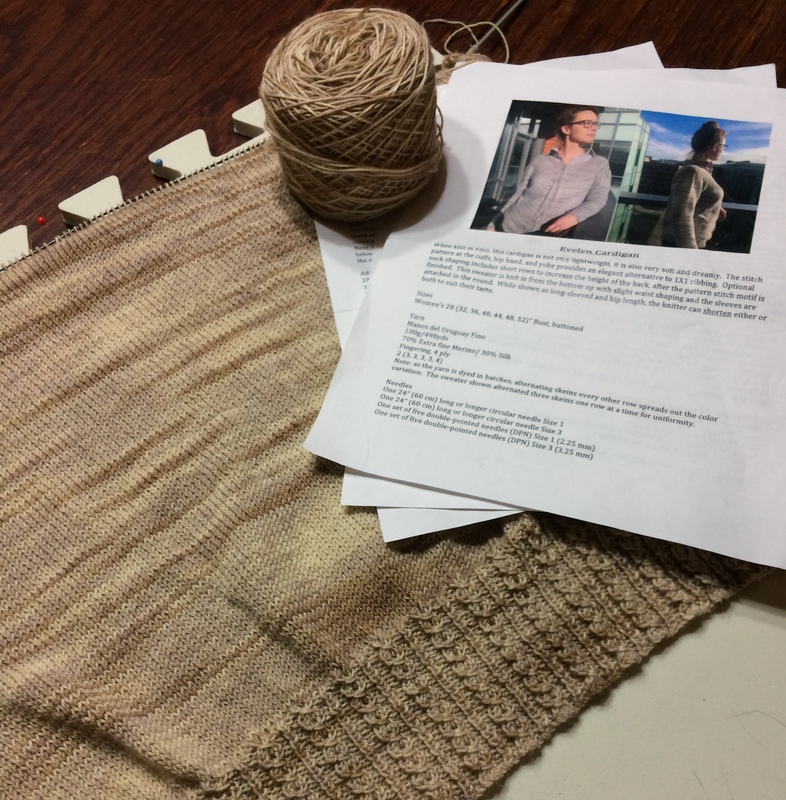 We’ll see 🙂 Last month I also started a test-knit for Paula Ladd, a very nice button up cardigan with a mock cable pattern called “Evelyn“. It is a bottom up cardigan, which I don’t knit very often because experience has taught me that I generally run out of steam before reaching the the yoke. I pulled this one through though, and I finished the body today. Now I can move onto the sleeves, Yay! Although it has been slow progress, I’m still pretty pumped about it and cannot wait to see it come to life in the next few weeks! That’s it for me, what have you guys been up to lately? 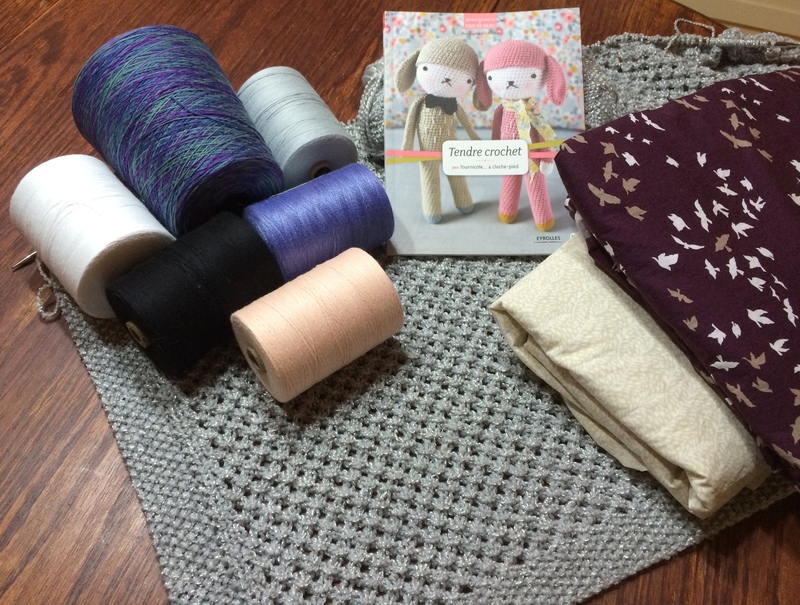 This entry was posted in Knitting, Sewing, Weaving and tagged art, baby wrap, blanket, cable, cardigan, cotton, craft, fiber, gift, knit, knitting, lace, passion, socks, weaving, yarn. 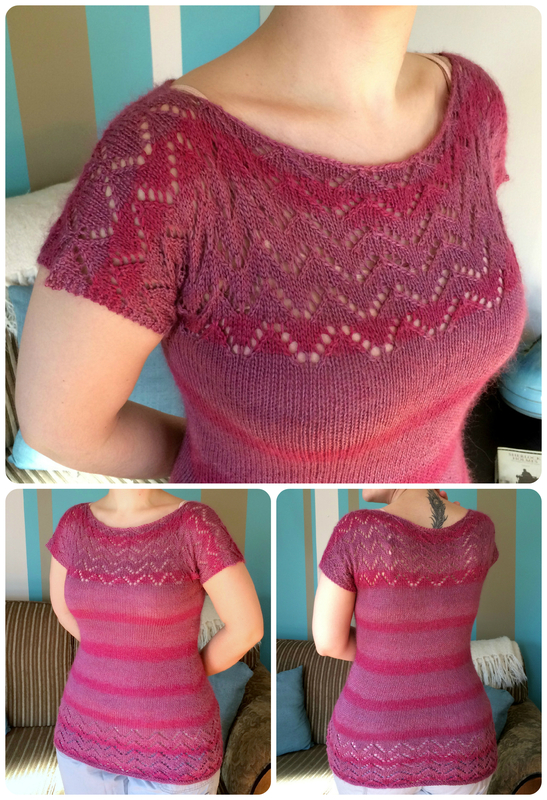 In total, I used over twice the yardage and finished twice as many projects in 2014 than I did in 2013, and it feels good. To those 16 knitting/crochet/weaving projects, I also have to add 2 464 yards of handspun yarn, 4 sets of placemats, and my first handmade quilt. Oh, you haven’t seen it? True… It was one of my secret Christmas projects. Well, talking about my secret Christmas projects… Here’s a couple of them. 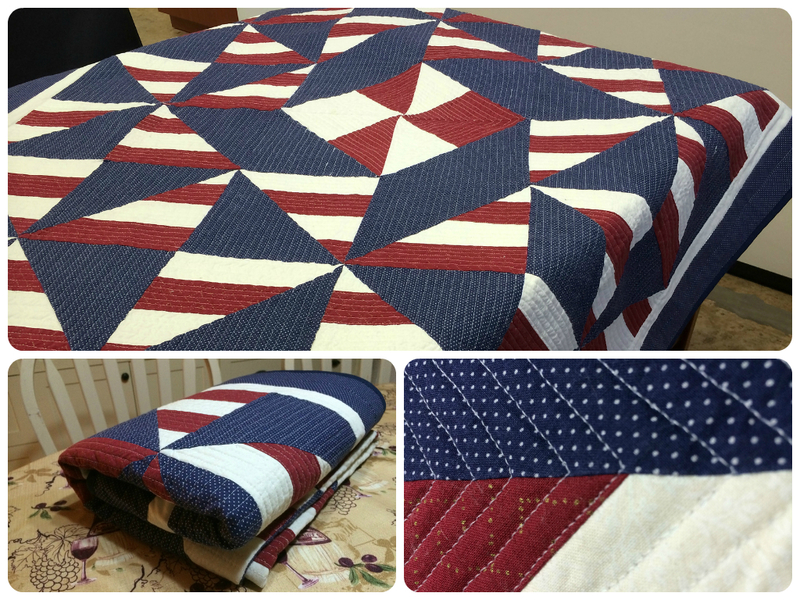 First is the quilt I made for my dad. It is my very first quilt, so it’s very wrinkly, uneven and full of mistakes, but I’m still very proud nonetheless. I worked on it for 2 years, and finally finished it a couple weeks ago, just in time for Christmas. 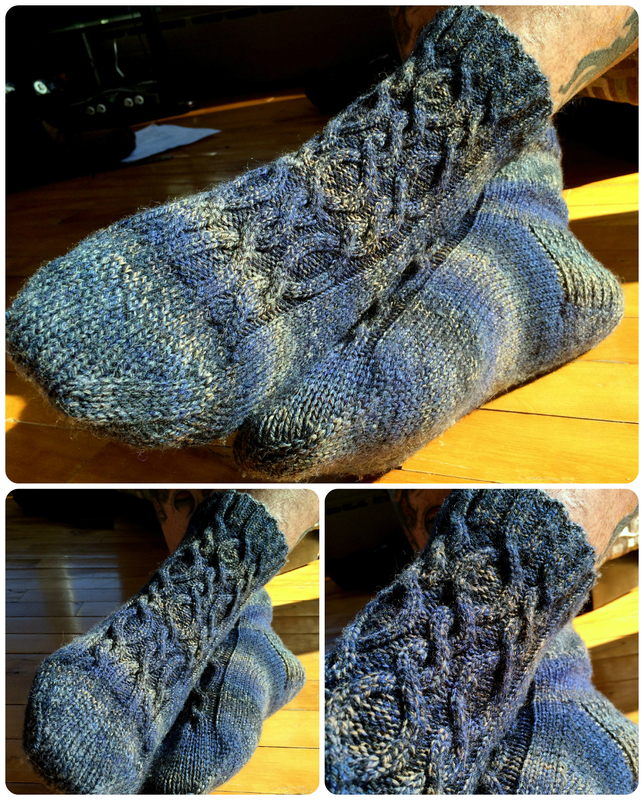 The second thing I want to share is a pair of socks I made for my honeybee’s sister, Emily. 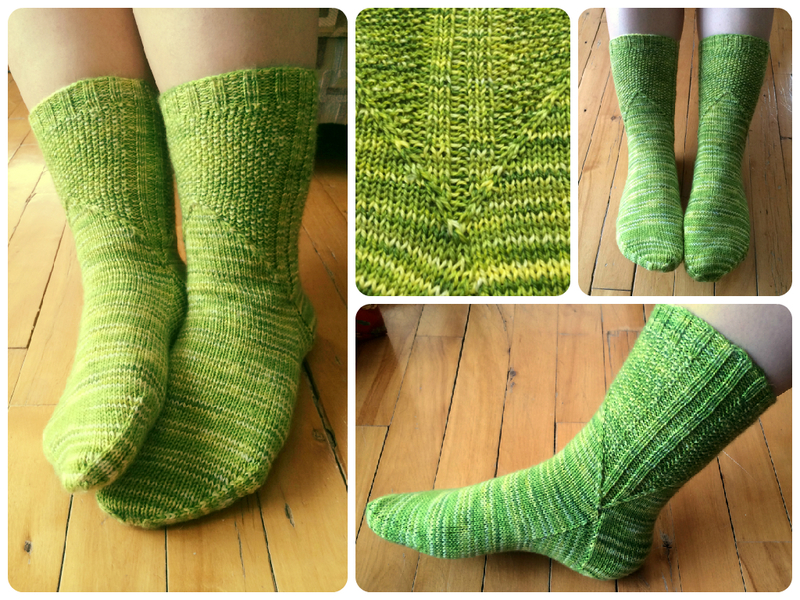 These Lemon & Lime socks were made using the Studioloo Bootsie-loo sock yarn I bought at the Twist Festival this fall, in the color “Linden Tree”. The pattern I used is called Seed Stitch socks, from Vogue. This entry was posted in Knitting, Sewing, Slice of life and tagged art, cardigan, cotton, craft, fiber, holidays, lace, needle craft, passion, project, quilt, quilting, sewing, socks, sweater, top, wrap up, yarn.